There are a couple of things that stand out about Jessica Wamala… her height and her smile. Both come into good effect in different ways, but it is her smile that is the killer. Wamala, 15, is a sophomore at Lowell High School and never fails to charm those she meets. According to a recent article in the Boston Globe, when she plays chess, she uses the same charm against her opponent except she slowly sets forth to destroy them on the chessboard. This brings a bit of irony and Wamala admits that it is not in good sport, but it is merely an expression of her enjoyment. The article gives a bit of interesting history of the Wamala family. 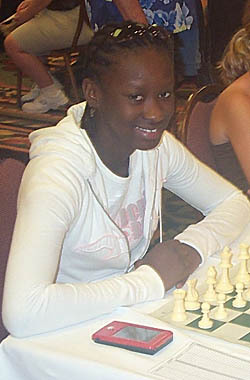 Severine Wamala grudgingly learned chess from a roommate in Uganda and taught the game to his children, Jacob (at seven years), Jessica (at six years) and Yowana. While Jessica has surpassed her father on the USCF rating scale, her brother has zoomed ahead and has sights on the Master's title. However, Jessica has signed in the past two years winning the right to represent Massachusetts in the Polgar Girls Invitational. The 6-foot tall sophomore at Lowell High School also has her sights set on a successful basketball career, but the article shows there is a lot of passion for chess. Jessica Wamala in her now famous smile. Read Mike Lipka's story on Jessica Wamala here!